"Life is boring and dirty"- Anton Tchechow perfectly defined the growing feeling of life of mass society in the beginning of the 19th century. 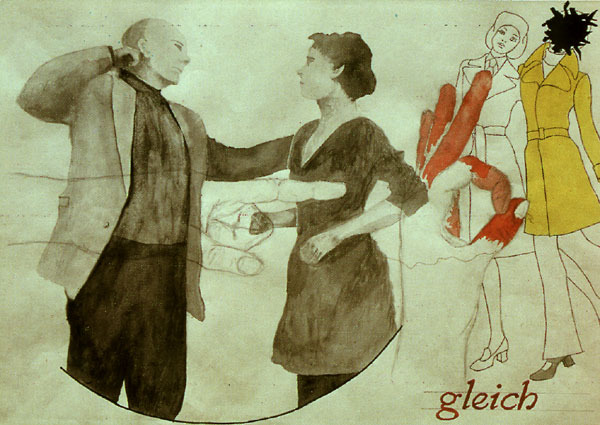 Ryszard Gòrecki combines this quotation in a drawing with other fragments of the world of standardized images. Covers from notebooks, brochures and catalogues made in GDR and Germany appear. Fragments of sentences, words, proverbs, as well as letters, signs and numbers are used. To sum up, the spectator is included in the world, which he interprets as one of permanently serviceable global signs and images. In addition, the aesthetics of crossover reminds some spectators of the socialist red light strategies of wall journals, or of pleasant-chaotic pin walls. Górecki's tools are still, in a time of high-tech, scissors, glue, scotch, feather, paintbrush, pencils and ink. This is one of the reasons why one equally realizes the pre-computerized didactics of the process and the comprehensible patchwork of the image levels. The visibility of our external appearance which has been reduced to clichés, signs and abbreviations, returns from second, third, fourth or fifth hand, refilled with this or that meaning, and is thus without value recycled. The former coding dissolves, because of a lack of context, but at the same time we have the context still in mind. This results in a well calculated level of familiarity and oddity. The scenarist of the whole doesn't design alternative or destructive pictures or social criticism, nor does he aim at demystifying and re-fetishizing the world of images, like it happened and happens in the classical Pop-Art and the present Post-Pop-Art. Ryszard Gòrecki calmly, and with a hint of irony, treats the waste of image-flows, and arrives at the now prepared wrappings, at the zones of a meta-level, where reality and certainty without idealism and illusionism maybe exist: "What I see is not what I know." (extracts on Ryszard Górecki's graphical work). Show cases are often fixed on classroom walls. They explain technological processes, natural phenomena, and the principal functioning of technical installations. My object cases and illustrations take over the external form of this didactical know-how transfer. But additionally, they are destined at showing the roles, appearances, and relations, to which people are submitted in modern society. Through the pragmatic logics of these functional models, people obtain their roles of subordination or control. Thus, they become a subject that has to reproduce the given types of behavior. The models of interpretation and explanation, on the other hand, gradually take the position of the object. This results in an inversed relation of reality, because now the models determine the to be dominated reality. This object-subject constellation leads to results that are not predictable or arrangeable. This then results in side products of thinking and illustration, that will often act negatively and deranging in this closed system, and they are thus unwelcome. My art is supposed to be one of these side products of the productive misunderstanding. I want to reflect important social occurrences by methods of art. In my work I try to introduce elements in the domesticated and fully automatic "normal" world, in a way that these elements don't correspond to the socially accepted definitions of this world. Through this fact, they prevent stereotypical ways of thinking and force to reflect, and they require new arguments and interpretations.